Many magazines have columns devoted to getting a designer look for less. Of course I have read them but never have I been on a quest for my own bargain look alike. Until about a month ago when I saw the Original Flea Saddle Bag. Click here to see a photo of this showstopper. It was elegant. It was classic. It was me in handbag form. It was also $440 and that was not going to happen for me. While I do pride myself on having a stellar handbag collection, this price tag was too much to bear when our child will be looking at college in 16 years. Nonetheless while the price was lofty, my need for this look in a bag still nagged me. The hunt was on. 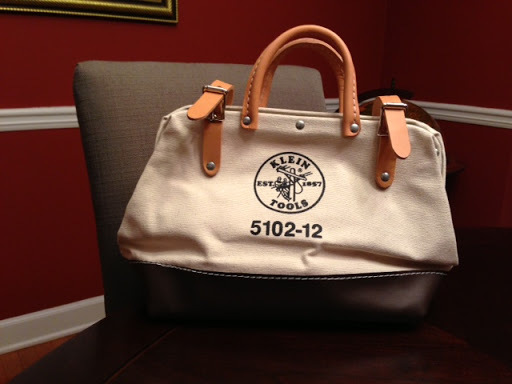 The Klein canvas tool bag. It took me a while to find one as the local hardware shops from Ace to Lowe’s did not carry them. Ebay has them in droves and the price is right! I snagged this 12 inch version for $36.00. They come as large as 24 inches but this one holds all of my things without the bottomless pit issues you get with larger bags. The look is similar to the $440 model, but it has the added bonus of having enough weight, thanks to the metal frame opening, to be used as a weapon if needed. Fashion and weaponry function. WINNER!